A shot of fun! Children in hospital have limited access to the arts and the magic of theatre. 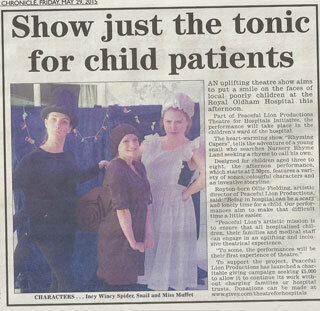 The Theatre for Hospitals initiative provides children in hospital and their families with a transformative experience, enabling them to experience a high-quality arts performance, where an emphasis upon the imaginative art of narrative and storytelling, can re-invent a clinical space. 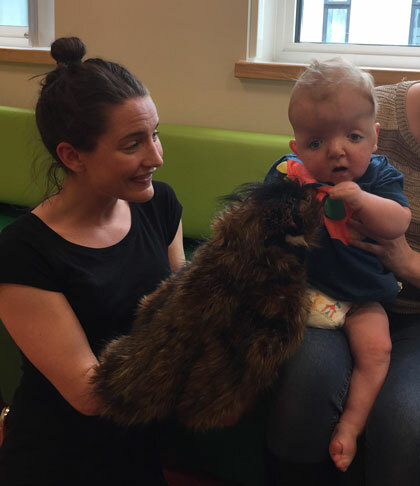 Our aim is simple: to provide a permanent touring ensemble, dedicated to taking children's theatre across UK hospitals, all year-round and to become a permanent part of the inpatient and outpatient experience, adding to the patient experience and contributing to the community of care. We have performed in over 10 different hospitals to over 150 children aged between 3 and 18 years as well as over 50 family members, hospital and clinical staff. Some of the hospitals we have visited include: Great Ormond Street Hospital, Evelina Children's Hospital (part of Guy's & St Thomas'), Wythenshawe Hospital, The Royal London hospital (part of Barts Health), Chelsea and Westminster Hospital, University College Hospital, St Mary's Hospital (part of Imperial Healthcare) and the Royal Oldham Hospital. Our aim is that all children will benefit from a respite from the clinical environment of a hospital. The project unites a community of children, families and medical staff through enjoyment during an often difficult time. This will be invaluable to vulnerable children who have to undertake longer term hospitalisation. 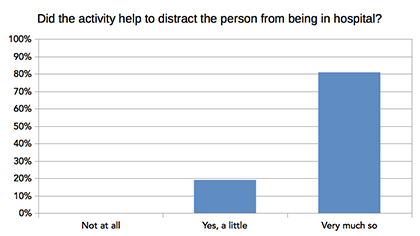 The above chart is taken from an evaluation we conducted after our performances in May 2014. The evaluation used a questionnaire based on the August Scale, an entirely non-invasive way of assessing the effect of the arts on health. After each performance we ask the children to respond to what they have seen by drawing a picture. 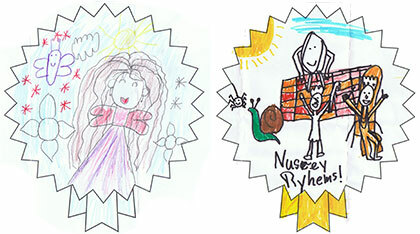 Here are some examples of the drawings we have received. Rhyming Capers is our specially conceived production designed to be staged within a limited space, with emphasis on character and song. 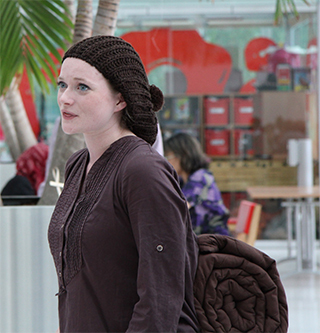 The plot is driven by a snail who is lost and confused in new surroundings, taking the audience on a journey to meet a range of different nursery rhyme characters. The aim is to build empathy with the audience and for children to identify with the individual situations. In May 2014 we visited six London hospitals to perform Rhyming Capers for the first time and in May 2015 we performed to five London hospitals and two hospitals near Manchester. 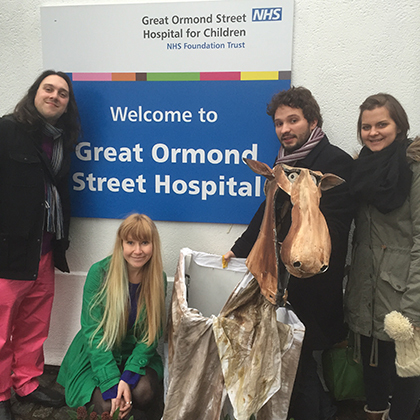 In December 2014 we visited three London hospitals to perform our production of Rosie's Magic Horse. With flying horses, ice-lolly mountains and pirates it's a great show to cheer you up. If you would like to find out more about the Theatre for Hospitals initiative please read our summary document or get in touch via the contact page. "We've never had anything like this. A live theatre experience is fantastic to have. It's really good for them, you can see what benefit it brings. It's really uplifting and invigorating and allows the sick children to express themselves. I'm really impressed. I think it would even help some of the older children. Thank you so much." "One little girl came in for an op this morning. She won't remember this morning now, she'll only remember how fun this was. I suppose that's the idea." "This is amazing. It makes me happy! The songs are very nice and the characters are funny. I loved the spider and rapping King! I have never seen anything like this before." "I just wanted to say thank you for the lovely performance of Rhyming Capers at Great Ormond Street hospital last week. My son was an inpatient and the show really cheered him up and brought him some entertainment from the "outside world". The actors were so engaging and funny, and it was wonderful to see my son laugh! I wish you all the best for your future plans and hope the hospital scheme will be a success." We've never seen anything like it. I liked the show and we would like to see it again." "My little one has only been in today but it has done her some good watching this. Usually she can't sit still but this really made her pay attention." "I've been volunteering here for a year now and this is the first time I've ever seen anything like this. It's great to have it."